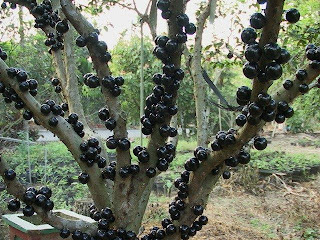 Jaboticaba is an incredible large shrub, or small tree, from Southern Brazil, but it is also present in adjacent countries of Bolivia, Paraguay, Uruguay, and northern Argentina. A profusion of white flowers makes the branches being loaded of various stages of maturing fruits when pollinated. The fruit is edible fresh or made into jams and jellies, or used to make wine. Jaboticaba makes a fine landscape shrub, tree or hedge. It can be grown as a patio or courtyard tree and is adapted to large container growing, but be careful because it does not tolerate low temperatures.